I’m making my return to WrestleMania Axxess this year and here are some details on what I’ll be doing there! 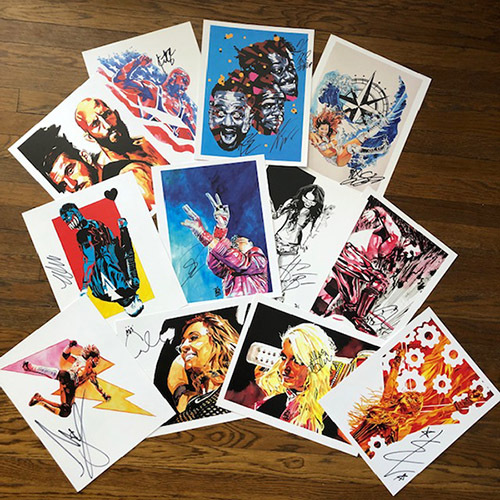 We’ll be inside Axxess selling prints, Superstar-signed prints, and other exclusive items to be announced. 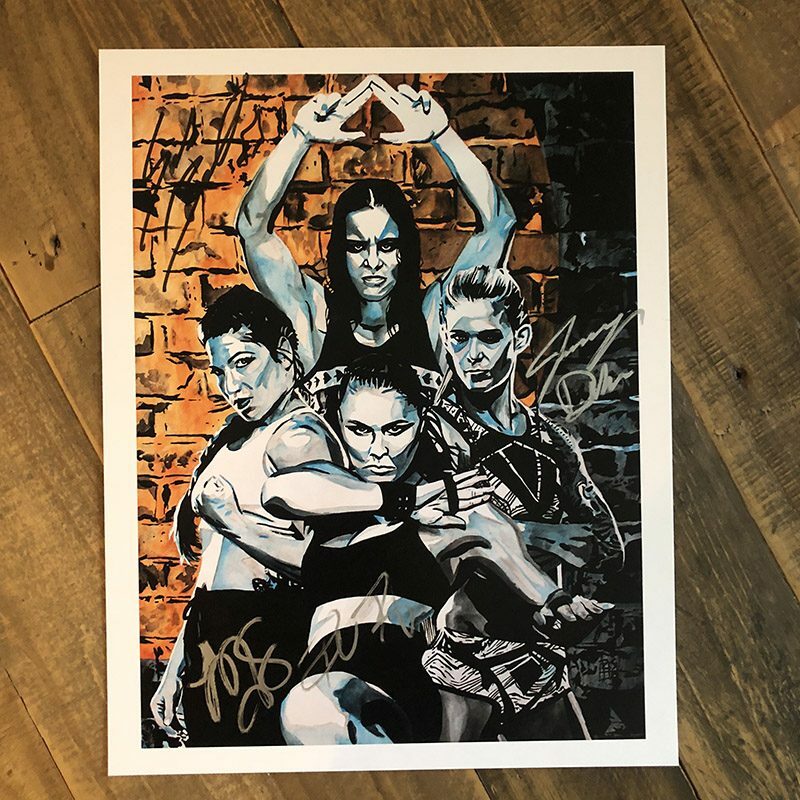 The above print of the MMA Four Horsewomen signed by Jessamyn Duke, Marina Shafir, the NXT Women’s Champion Shayna Baszler and the Raw Women’s Champion Ronda Rousey! This will be made available during the first Axxess session on Thursday. These are priced at $150 each. 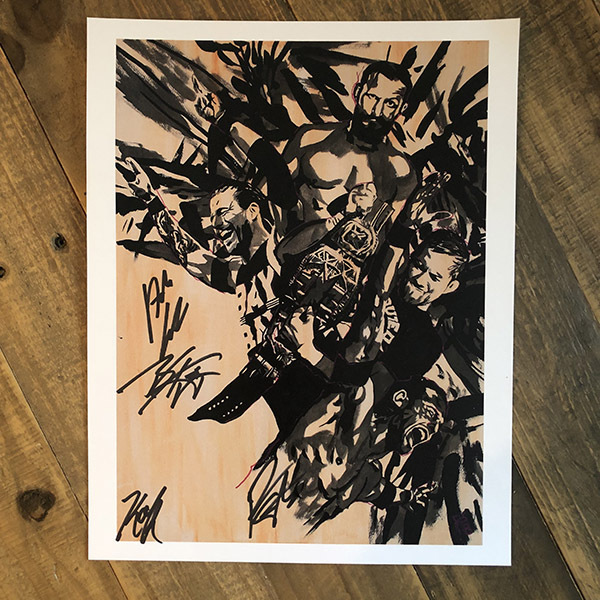 This print of all four members of Undisputed Era, signed by Adam Cole, Bobby Fish, Kyle O’Reilly and Roderick Strong will be made available during the first Axxess session on Friday. These are priced at $100 each. 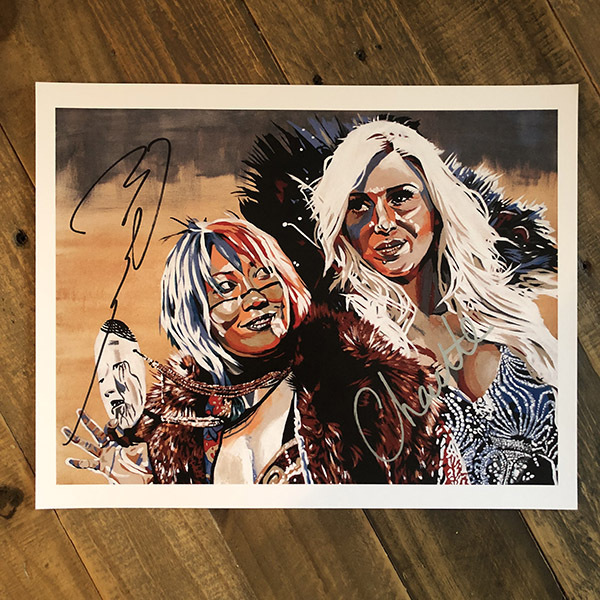 This print signed by Charlotte Flair and the SmackDown Women’s Champion Asuka is of the image I painted live at last year’s Axxess and will be made available during the first Axxess session on Saturday. These are priced at $100 each. I’m spreading out the release of these other two signed prints to be a bit more fair to folks who may not be able to make it on Thursday and to reward those of you coming on multiple days. Selfishly, I want to see your beautiful faces more than once. These are a limited quantity and are available as long as they last. I don’t have a guarantee that any or all of these will still be available by Monday. I’ll also have extremely limited edition signed prints as doorbusters for each session. Like, only one or two limited. People like Jeff Hardy, Boss n’ Hug, Rey Mysterio and more surprises! These will be announced on social media before each session starts, so keep an eye on @robschamberger while you’re in line! Another one of the EXCLUSIVE items I’ll have is this print set, collecting the popular Playing Card Series! 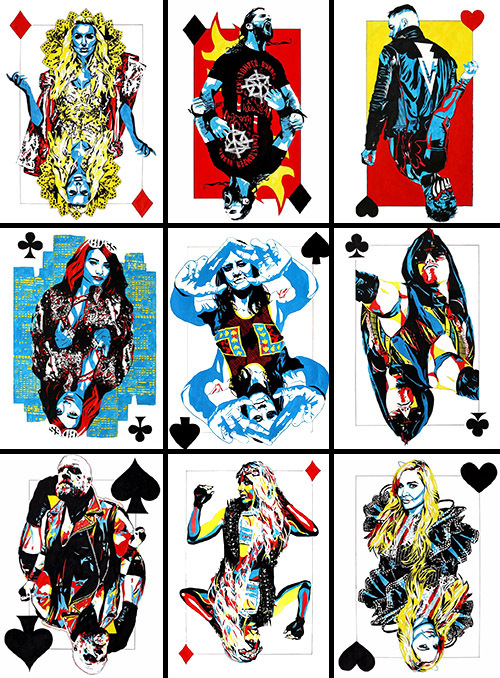 It will have 13 total 4″x6″ prints including the nine above as well as Undertaker, AJ Styles, and debuting at Axxess Ruby Riott and the Macho Man Randy Savage! All of that for only $20! Your poker room’s going to look straight up amazing, right? I’m painting Ronda Rousey vs Becky Lynch vs Charlotte Flair live and filming that process for Canvas 2 Canvas, the longest-running original show on WWE’s YouTube channel. So if you’re cosplaying or have an adorable child who would say ‘not bad’ really well, let us know so that we can get you in the episode! I’m also in talks with several companies to provide you with some, well, phenomenal freebies. Once those are ready to be announced I’ll let you know right away! Trust me, they’re things that will handsomely reward you. ALSO! As announced on PWInsider for the first time I’m going to have an interactive booth this year. Anyone who spends over $50 on my art will be able to collaborate with me on a very special art project. See, the backdrop for my display will be a 20 foot(!) wide print of the above painting. What we’re going to do is if you hit that $50 minimum I’ll have paint markers and you’ll get to tag it, 1980’s NYC subway station style! Over the course of the week this’ll fill up and look pretty damn rad by the time it’s done. It’s going to be our biggest and best Axxess yet and I’m thrilled to share it with you!